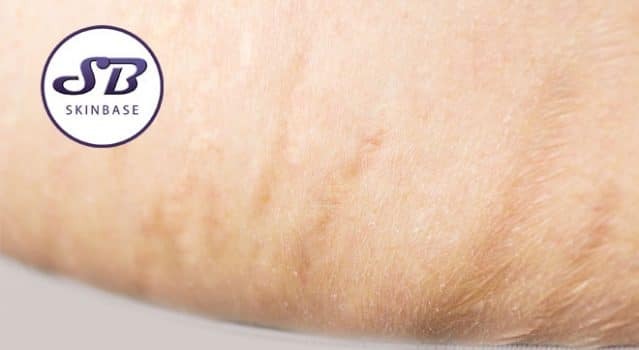 Stretch marks can be a huge source of insecurity for anyone who gets them, but help is available. SkinBase have a range of treatments that can help. The treatments work with your skin encouraging the natural healing processes for long-term, effective results. SkinBase Microdermabrasion can be a very effective treatment for red stretch marks. It removes dead skin cells and encourages the skin to produce new, healthy cells more quickly. This helps to fade the red marks, but Microdermabrasion also improves the texture of the skin by stimulating collagen production. Collagen helps to smooth out the skin, undoing the ‘dipped’ appearance of stretch marks as they blend. Because of the differences between new stretch marks and old stretch marks, it’s always been thought that Microdermabrasion works best on marks that are still ‘actively damaged’, however, recently we’ve been seeing fantastic results on older stretch marks too, which proves that the rejuvenating properties of microdermabrasion really are extraordinary. If you have a really intense outcrop that leaves your skin looking crumpled and uneven, you could combine or alternate SkinBase Radio Frequency + Microdermabrasion treatments. Radio Frequency is one of the best ways to improve skin texture because it floods the skin with collagen, which means the skin will become firmer, smoother and more taught. It even helps to improve muscle tone, which makes the skin look even better. In a combined treatment, Microdermabrasion is performed immediately before Radio Frequency to effectively target all aspects of stretch marks – uneven skin, visible skin pigmentation, and lack of firmness. To have this treatment, contact us to find a therapist who offers both treatments.